It appears that the internet hacking group “Anonymous” has just got a hold of Hillary’s medical records, since she won’t release them, and they are brutal if real. 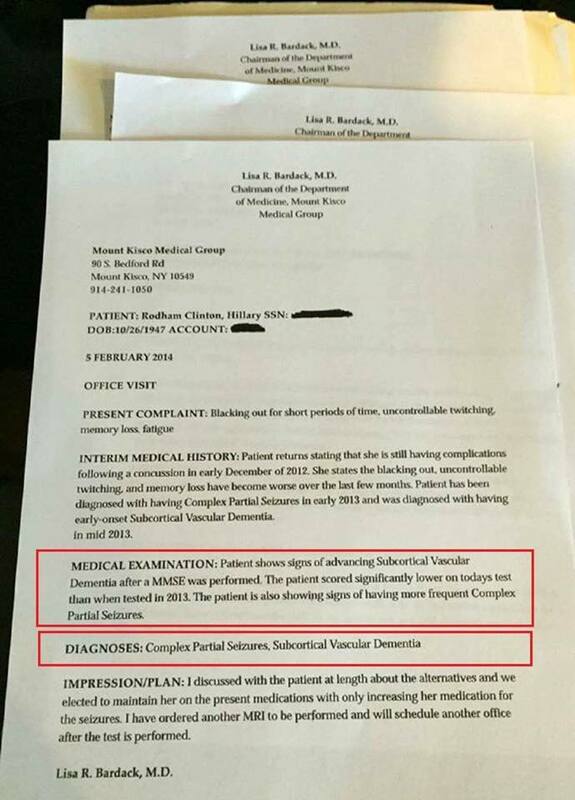 Lisa R. Bardack seems to be a real Doctor (internist) at Mount Kisco, nearby Clinton’s residence in Mid Westchester County, NY. BD is a progressive disease; there is no cure. Changes may be sudden or gradual and then progress in a stepwise manner. BD can often coexist with Alzheimer’s disease. Behaviors that slow the progression of high blood pressure, diabetes, and atherosclerosis — such as eating a healthy diet and keeping healthy wake/sleep schedules, exercising, and not smoking or drinking too much alcohol — can also slow the progression of BD. Watch Hillary freeze up after being startled by a protest sign. Has to be coached back into talking, then starts up about Trump kids killing animals. The HIPAA law, which protects the privacy of health information, is almost absolute. Public figures are definitely protected. Details we see about their results from them (the patient) releasing it themselves; or a snooper viewed records without authorization (a HIPAA violation in itself) and leaked details. It is to a politicians advantage and a wise move to release all records concerning their health in order to gain the confidence of those that trust them as well as ward off or minimize the attacks of those that don’t. The damage that would result from hiding a disabling function caused by medical ailments is not one wishes on anyone, which also means it is one we would not want to wish upon ourselves by electing such a person. When you re running for the POTUS, the people have a right to know and if they lie, well, the Hackers will tell us. It got hacked like anything else that is on the internet. Snapshots of anyone are only content of the moment — videos are more damning and plenty of those are coming about, but still within a confined time frame. Until this happens on live TV to a national audience, it is going to be a hard sell without proper and original source documentation. The images for the report above lack any official stamp of Mount Sinai as well as that of the doctor — so in the worst case scenario they could have been conjured up on Word by someone with enough know-how to collect the right information (off the web even) on a print out and then take a snapshot. I want to believe all the claims of Hillary’s health are true as it is something no one will overlook, even those overlooking everything damning about her in the first place. And truthfully, I can’t even accept the CNN article as it is filtered and not information from an original source. We are in the same situation as Obama’s birth certificate — everyone knows one exists but documentation from and original source is still highly lacking. Electronic health records (EHR’s) can be hacked by a very savvy hacker, but they don’t look like a snapshot of a physician’s typed note. I can’t go with this until I see something that looks more reliable. I am a natural born Sceptic. I remember when G. W. Bush was accused of desertion from the Air National Guard. They could not even fake the right dot-matrix printer that was used at the time. They used a modern font that was not available for another 20 years. But I believe that the we should consider this as possibly true. The doctor is a real person. The address is real, and the phone number has correct area code. ( since been changed) She works at this Medical Center. But what makes me want to believe it is true, is Hillary Clinton’s actions recently on film. She lost her balance walking up steps, had to be supported by secret service while standing on a small raised platform, facial tics, uncontrolled head movements, and losing her train of thought. She also disappeared for a long period of time during a debate. She has been roped off from the media at events and has not had a press conference in at least 6 months. This is unheard of in a political campaign. I believed that her 2012 stroke was just a ploy to get her out of testifying before congress. But I see a pattern of behavior that is degenerative. If true, then someone in Clinton’s home or someone who works in the Dr. Office snapped this picture with their smart phone and leaked it to someone. Look for another body to mysteriously be found somewhere. Or look for the DNC to go after this Doctor and ruin her career. If the media needs to do their job. They have to get in her face, and ask her tough questions, while camera are flashing. Then and only then can we ascertain her mental health. But they are only allowed to ask pre-screened questions, with limited access to this Presidential candidate. Well said; we have a right to know. This is the POTUS and the VP will become president should she have to leave the office for health reasons. This is a good reason NOT to vote for her! Well obviously Sandy you are not paying attention; she fell and had a concussion several years ago and has been treated extensively; was rushed to the hospital in full view of the media. She has had several seizures on tape while being interviewed and the media has tried to cover up, but we have them; there are many pictures of her being held up so she doesn’t fall, she has a traveling doctor holding an injection pen ready to inject her if needed (highly published), and now here are the records. What would it take for you? Go to some of the trump sites; he is actually telling the truth about her. The problem i9s she won’t make it for 4 years and Tim Kaine will be the president. Trump is not my favorite, I preferred another candidate, but at least we know he is healthy and has his wits about him! I watched footage of Hillary and even I can see, she is unwell! She should be home in bed, not running for President! Got some new for everyone. If this repot is true,,,,, Hillie’s career is over. Subcortical vascular dementia is incurable and is just a waiting game. I’ve seen nursing homes filled with people with this diagnosis.